Welcome to Allergy Free & Cheap Like Me! I’m so happy you are here! I hope to create a place for you to find lots of information about food allergies, as well as, lots of goodies to help you not only eat better, but more affordably! Please feel free to share all of your own tips, tricks, and recipes too! Thank you for stopping by and I hope to see you again very soon! You can read more about my allergy story here. This holiday season I was lucky enough to have the kind folks at Udi’s send me some of their gluten free products to sample. One of these products was Udi's Mighty Bagels. During the holidays, there is never a shortage of leftovers. Unfortunately, you can only have Thanksgiving or Christmas dinner reheated so many times before your palate gets tired of eating the same things over and over again. 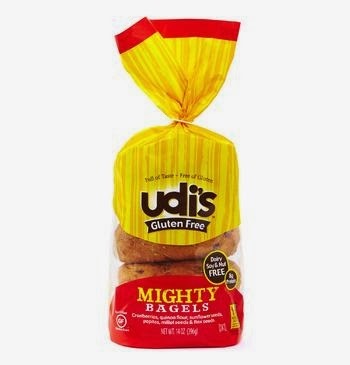 To change things up a bit, consider using Udi’s Mighty Bagels to prepare an open-faced sandwich; it’s quick, easy, and satisfying. To prepare cut the bagel in half, add mustard or spread of choice, top with a thick wedge of cheddar, a modest slice of ham, and a lite dusting of garlic salt to taste. (Mouth watering yet?) Heat in the microwave or toaster oven until cheese is melted and enjoy. I think my husband looks forward to these open-faced sandwiches more than the holiday dinners themselves. Water, tapioca starch, brown rice flour, non-GMO canola oil, egg whites, dried cane syrup, tapioca maltodextrin, sunflower seeds, dried cranberries (cranberries, sugar), tapioca syrup, millet seed, flax seed, whole quinoa flour, pumpkin seeds, xanthan gum, yeast, salt, pea protein, cinnamon, cultured corn syrup solids and citric acid (natural mold inhibitor), enzymes. My Verdict: These bagels are hearty. They are yummy and have a great texture. It is hard to believe they are truly gluten free. The only downside in my opinion is they contain eggs. So those who have an issue with eggs you are out of luck! *Udi's did supply me with this product to review, however as always the opinions in this post are 100% mine and have not been influenced by anyone or anything. Want to be the first to know about the newest recipes, tips, tricks and more? Get updates delivered free to your inbox by entering your email address below. Gluten-Free Novak Djokovic Wins Wimbledon!